(Nanowerk Spotlight) At at a meeting of infectious disease experts in Copenhagen in March 2012, the Director General of the World Health Organization (WHO), Dr Margaret Chan, has warned vividly that the growing threat of antibiotic-resistant bacterial strains may pose grave risks for society: "A post-antibiotic era means, in effect, an end to modern medicine as we know it. Things as common as strep throat or a child's scratched knee could once again kill." Chan pointed out that there is a global crisis in antibiotics caused by rapidly evolving resistance among microbes responsible for common infections that threaten to turn them into untreatable diseases. Every antibiotic ever developed was at risk of becoming useless. Tackling this topic, the WHO recently published a book, "The evolving threat of antimicrobial resistance - Options for action" (free pdf download). It describes examples of policy activities that have addressed antimicrobial resistance in different parts of the world, with the aim of raising awareness and in particular to stimulate further coordinated efforts. Chapter 1 of this book, titled "The evolving threat of antimicrobial resistance Introduction" lays out facts and details that form the basis for Chan's warning: A bacterium which causes disease reacts to the antibiotics used as treatment by becoming resistant to them, sooner or later. This natural process of adaptation, antimicrobial resistance, means that the effective lifespan of antibiotics is limited. Unnecessary use and inappropriate use of antibiotics favors the emergence and spread of resistant bacteria. A crisis has been building up over decades, so that today many common and life-threatening infections are becoming difficult or even impossible to treat, sometimes turning a common infection into a life-threatening one. It is time to take much stronger action worldwide to avert a situation that entails an ever increasing health and economic burden. "Our group took this issue seriously years ago when death rates associated with multiple organ failure caused by bacterial infection appeared to increase in the intensive care units of local hospitals," Young-Chien Ling, a professor in the Department of Chemistry at National Tsing Hua University if Taiwan, tells Nanowerk. "We started to explore treatment options using nanomaterials in the hope of finding antimicrobial mechanism different to conventional antibiotics." Coincidentally, the U.S. Defense Advanced Research Projects Agency (DARPA) also seeks to replace antibiotics with rapidly adaptable nanotherapeutics. They argue that recent advances in nanomaterials, genome sequencing, nucleotide synthesis, and bioinformatics could converge in nanotherapeutics with tailored sequence, specificity, and function that can overcome earlier challenges with small molecule-based approaches. Back in 2006, we already reported on Ling's early work on antibacterial nanomaterials ("Antibacterial wallpaper through nanotechnology"). A new paper by Ling's group, "Graphene-Based Photothermal Agent for Rapid and Effective Killing of Bacteria", reported in the January 29, 2013 online edition of ACS Nano, is following the same logic of capturing and killing bacteria – only this time using graphene. 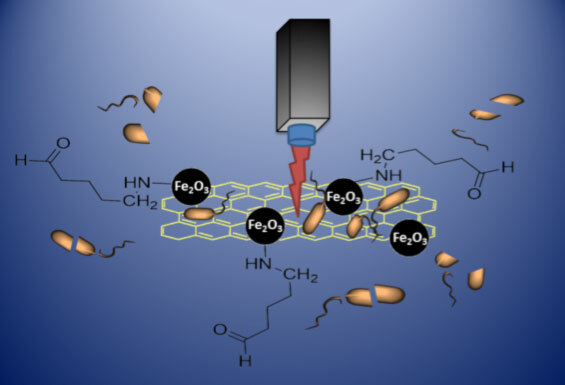 In this new work, the bacteria – both gram-positive Staphylococcus aureus and gram-negative Escherichia coli – were efficiently captured by glutaraldehyde and concentrated (or immobilized) by the magnetic properties of magnetic reduced graphene oxide functionalized with glutaraldehyde (MRGOGA). The bacteria were rapidly killed by multiple means, including conventional oxidative stress as well as physical piercing and photothermal heating of graphene by near-infrared (NIR) laser irradiation. "In this context, our proposed antimicrobial treatment system is a binary treatment system that allows the targeted bacteria being separated and concentrated from the healthy biofluids/cells/tissues/organs first and subjected to focused killing thereafter, minimizing the adverse side effects," explains Ling. "The controllable and multiple killing mechanisms offer additional advantages of enhanced efficacy and reduced time." Photothermal therapy has been widely developed by combining pulsed laser and strong light-absorbing materials such as gold nanoparticles, carbon nanotubes, and graphene. Their unique optical properties enable these nanomaterials to absorb light irradiation and release it as heat. Graphene and graphene derivatives have been explored widely in biomedicine due to their exceptional chemical and physical properties. In previous work, researchers have made the surprising finding that graphene-based nanomaterials – graphene oxide, graphene oxide and reduced graphene oxide – possess excellent antibacterial properties (see for instance: "Antibacterial paper made from graphene"). They discovered that the toxicity mechanism of graphene-based nanomaterials includes oxidative stress, physical piercing through the sharp edges of graphene nanowalls, as well as photothermal heating. In their new research, the team combined the advantages of the excellent photothermal properties of reduced graphene oxide upon NIR laser irradiation and glutaraldehyde as efficient capturing agent towards both bacteria. The magnetic characteristic of this novel photothermal agent result in the captured bacteria being readily trapped into small volumes by an external magnetic force. The researchers demonstrated that MRGOGA efficiently captured and effectively killed bacteria within 10 minutes upon NIR irradiation. "Furthermore" says Ling, "we employed a microfluidic chip system to demonstrate the re-usability of MRGOGA, offering a biocompatible platform for photothermal sterilization. The magnetic and low cytotoxicity properties of MRGOGA also make it an ideal candidate for in vivo biomedical applications by taking advantages of easy mobilization at targeted position and minimum cellular damage."